The San Diego Law Office of Sarah T. Schaffer, APC is a full service Family Law and Mediation practice dedicated to delivering practical & effective results to our local San Diego area clients. 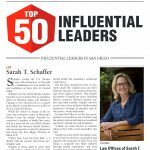 Ms. Schaffer opened the Law Office of Sarah T. Schaffer, APC in Del Mar, California, after spending four years practicing law at Higgs, Fletcher & Mack LLP in San Diego. California attorneys who are certified as Certified Family Law Specialists have taken and passed a written examination in their specialty field, demonstrated a high level of experience in the specialty field, fulfilled ongoing education requirements and been favorably evaluated by other attorneys and judges familiar with their work. Sarah T. Schaffer, CFLS is one of a select handful of Certified Specialists. Only these attorneys can identify themselves as “certified” specialists in California because they are the only attorneys who are certified either by The State Bar of California Board of Legal Specialization or an organization whose certification program has been accredited by the State Bar. In 2011, Ms. Schaffer received her LL.M. in taxation at the University of San Diego School of Law. Raised in the Boston area, Ms. Schaffer graduated from Stanford University with Departmental honors and a dual major in Spanish and International Relations. During this time, she spent a year studying at the University of Salamanca in Spain. Sarah is fluent in Spanish – helpful for first-generation Spanish-speaking clients. Upon graduation, Sarah was commissioned in as a Second Lieutenant in the United States Marine Corps and spent five years on active duty serving as a logistics officer in Okinawa, Japan, and Quantico, Virginia. USMC JAG officer – In addition to her San Diego divorce and family law practice, Ms. Schaffer currently serves as a Colonel in the United States Marine Corps Reserves acting as a Staff Judge Advocate for the 4th Marine Aircraft Wing.